Solar power, always a popular subject but a tiny piece of America&apos;s energy puzzle, could be looking up — literally — as power drawn from America&apos;s roofs could provide juice without the carbon, trade balance and security concerns of fossil fuels and the huge upfront costs and land-use hassles of bigger solar projects. Permitting delays for large photovoltaic projects (where sunlight hits silicon chips and creates electricity) are likely to disrupt an industry endeavoring to grow at 50 percent a year. Meanwhile, electricity from large solar thermal farms (in which sunlight heats water to turn electrical-generating turbines) need a vastly upgraded power grid to deliver the power they produce in remote areas to the nation&apos;s cities. A solar acreage land rush is now in full swing in the Southwest. But there&apos;s a partial way around such regulatory and infrastructure bottlenecks. Rooftop solar installations — putting photovoltaic systems on the roof of your workplace or even your home — have few regulatory impediments and drip into the grid from a lot of points instead of gushing in from one massive operation. The cost of buying and installing solar cells are, however, a significant barrier to building owners investing in rooftop solar electricity. Still, new financing options are opening up, with solar power purchase agreements, or PPAs, solar leasing and solar financing districts increasing the options available to property owners. Greentech Media forecast in early 2008 that PPAs — "in which companies pay the upfront costs of solar-power projects in exchange for a contract requiring the customer to buy the resulting electricity" — will drive 75 percent of commercial and industrial solar system sales by 2009, up from 10 percent in 2005. Residential solar lease financing is also beginning to gain traction in the United States. In California and several other states, cities and counties can create energy finance districts for commercial and residential solar system purchases with loan payments made through 20-year property tax assessments. Despite not renewing tax credits for renewable energy technology in the 2007 energy bill, tax credits and incentives are still an important component of solar photovoltaic economic viability in the U.S. and most other countries. Congress did pass the Expanded Federal Solar Investment Tax Credit in late 2008. 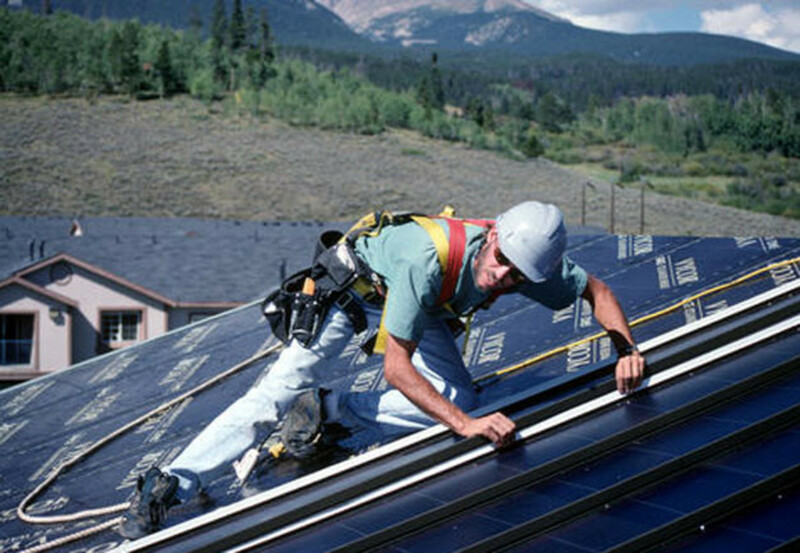 Some of its incentives for solar electric installations, including rooftop photovoltaic systems, include extending (for eight years) a 30 percent tax credit for residential and commercial solar systems, eliminating the $2,000 limit for residential solar electric installations, and authorizing $800 million for clean energy bonds. How Much Am I Bid for This Shingled Beauty? To accelerate solar energy investments, I have proposed creating an auction exchange market connecting solar integrators and building owners, which would be expected to drive market efficiencies and speed adoption of solar rooftop leasing. Real estate exchange markets have existed for centuries. More recently, auction markets for the buying and selling of CO2 carbon credits are developing in the U.S. and have existed for several years in Europe. As more buildings are offered up for solar leasing, marketplace liquidity should expand in much the same way as eBay and Alibaba&apos;s exchange liquidity has expanded. Alibaba.com is the world&apos;s largest business-to-business e-commerce company. It connects millions of online business buyers and suppliers around the world every day. MMA Renewable Ventures is one of the early innovators of solar PPAs, and by the end of 2008, it expects to own and operate more than 40 megawatts of solar PPAs. MMA&apos;s purchase-power-agreement-financed projects include a 14-megawatt Nellis Air Force Base system (until recently, the largest photovoltaic system in the Unites States), and a 2-megawatt project at Denver International Airport. Rooftop leasing and PPAs solve many of the barriers to a building owners&apos; decision for committing rooftop square footage to a photovoltaic system. In addition, "solar integrators" — resellers who also act as middlemen between manufacturers, installers, government and property owners — have far better technical expertise, purchasing and installation economies of scale than most building owners and can be expected to find a welcoming niche if rooftop solar takes off. By installing their wares on some roofs and keeping the energy provided (making it worth the property owner&apos;s while by providing them cut-rate power), rooftop leasers have made the crushing upfront costs bearable for small businesses and residential owners. Local and state governments are adopting solar electricity PPAs as well. In California, the city of Santa Barbara (home of Miller-McCune) recently leased city-owned building rooftops for a 330-killowatt photovoltaic system under a 20-year PPA. The project was required to meet the aesthetic standards of Santa Barbara&apos;s historic downtown area while providing power to service the equivalent of 1,040 area homes. According to Mayor Marty Blum, "We are quite pleased with the project&apos;s success and have plans to develop a similar project at the Santa Barbara Airport which will also provide shade for the airport&apos;s long term parking lot." The California-based company Solar City, the state&apos;s top residential solar power provider according to California&apos;s Public Utilities Commission, is rapidly growing the leasing approach for homeowners. 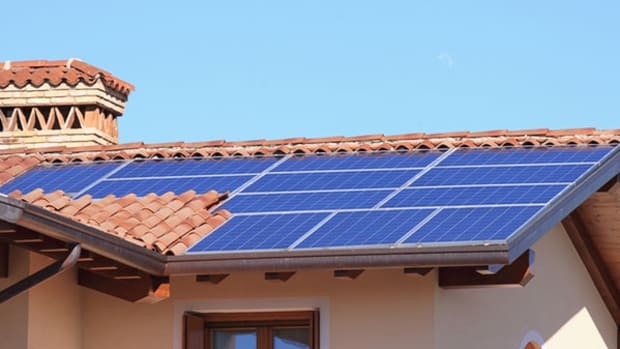 "Thanks to new financing options, rebates and tax credits, an investment in solar power delivers a better, more predictable return than most other investments available today," Solar City&apos;s CEO, Lyndon Rive, said in a press release as the Bay Area municipality Foster City earlier this month announced an ambitious residential solar program called 1 Block Off the Grid. "One of the industry&apos;s greatest challenges," Rive added, "is making more people aware of these benefits." The numbers bear him out. The U.S. has only 40,000 solar electric homes, which have primarily been direct purchases. Through solar leasing and PPA arrangements, building owners get guaranteed electricity at lower rates and little or no money down while making productive use of otherwise idle rooftop space. Nearly all performance, reliability, maintenance and financial risks shift to the solar integrator. Rooftop leasing could also significantly increase the number and density of buildings that become electricity generators in urban areas. In addition, higher urban solar-building densities would take the load off generators located outside city limits, making more daytime spare transmission-grid capacity available and, in theory, limiting summertime power grid overloads. In March 2008, ProLogis, the world&apos;s largest owner of distribution facilities, entered into an agreement to lease roof space to Southern California Edison, the largest electric utility in California, as a part of the utility&apos;s new solar power program. ProLogis owns 180 distribution facilities in SCE&apos;s territory, covering 41 million square feet. "This project has the potential to become a breakthrough solar energy program," said Jeffrey H. Schwartz, the chief executive officer of ProLogis. SCE is planning to complete 50 megawatts of solar panel installations each year in its service area, for a total of 250 megawatts. Individual installations are expected to generate 1 to 2 megawatts per system. Along with decreasing photovoltaic panel costs, installation costs are decreasing rapidly for rooftop systems due both to innovation and scale. These cost reductions will serve to increase the net present value of a building by making the roof photovoltaic systems&apos; electricity more competitive and increasing the available profit over the lifetime of the leases. An example of innovation at work in rooftop installation cost reduction is Solyndra Inc. For commercial low slope roofs, Solyndra has developed thin-film CIGS (copper indium gallium (di)selenide) photovoltaic tubular panels that require no roof penetrations, lay completely flat and reduce installation costs by up to 50 percent. And, module installation time is as little as one day. The tubular design makes the panels relatively efficient even when the sun isn&apos;t directly overhead. In November 2008, Solyndra signed a long-term sales contract with Carlisle Energy Services to supply thin-film panels worth up to $320 million, bringing their total order backlog to more than $1.5 billion. Other companies are looking to put solar generation directly into building materials. Ascent Solar for example, is developing thin-film building-integrated photovoltaics that can sheath building exteriors in solar cells using materials like Ascent&apos;s thin-film PV aluminum siding. There are clouds on the horizon, however, in particular, the boom-and-bust nature of the solar industry. "Constraints along the PV supply chain (such as the current silicon shortage) could result in higher module prices or constrained supply, thus decreasing market penetration," Navigant wrote in the 2008 NREL study. "In addition, significant international demand could draw supply away from the U.S. market, thus decreasing U.S. market penetration." In addition, the base of skilled workers able to install rooftop solar is limited, although how the financial crisis and the federal stimulus and green jobs goals impact that remains to be seen. Polysilicon prices have recently dropped to $200 per kilogram from $475 earlier in 2008. Jeff Osborne of Thomas Weisel Partners estimates that polysilicon prices will drop below $100 by the end of 2009 and to a range of $50 to $80 in 2010. By the end of this year, the Chinese firm LDK is set to become the world&apos;s largest solar photovoltaic wafer supplier with a planned capacity of 2 gigawatts, with a 3.2-gigawatt capacity planned for 2010. Eventually entire sun exposed commercial building exteriors can be leased for solar electricity generation, thereby generating revenue for building owners, minimizing their investment risk and increasing the value of their sun-exposed properties. As photovoltaic panel and installation costs continue to decline, expect new forms of lease financing and PPAs will contribute significantly to accelerating the shift to solar electricity globally.